The Sullivan's Gulch Trail, which avoids busy street intersections, is a great example of true 'Vision Zero' accident-prevention planning. There never has been a better time to build the first phase of the Sullivan's Gulch Trail, by connecting it to the proposed bike/pedestrian Sullivan's Gulch Bridge across I-84/MAX at Northeast Eighth Avenue. Developers are currently building and planning huge multifamily projects along this corridor, in anticipation of the trail that will reduce auto use, parking needs and appeal to tenants with less income. Major property tax revenue will be collected in perpetuity from these and other projects, which helps justify public investment in Sullivan's Gulch Trail development. The SG Trail Concept Plan was developed by the Sullivan's Gulch Trail Committee, planned by CH2MHill, approved by the Portland City Council and officially supported by 15 neighborhood associations, businesses and developers. Exclusively for bicyclists and pedestrians, the trail will enable users to traverse under all bridges on the north bank of I-84 between the Willamette River and Gateway Green. Centrally located, the corridor is off streets, but connects to all north/south bridges over I-84. Once the SG Trail is built, it will prove to be the safest, most well-connected active transportation corridor in the region. Unfortunately, senior staff at Portland's Bureau of Transportation (PBOT) prefer that bicyclists continue to challenge vehicles, versus this safe and important trail connector to SW, NW, SE, NE and North Portland under Grand Ave./MLK Jr. Bridges. PBOT's basic rule should be, "If the bike corridor is safe enough for a child to ride, go for it." Five-inch painted stripes on streets between fast-moving vehicles and bicyclists is dangerous compared to safer greenways on neighborhood streets and well connected off-street trails. 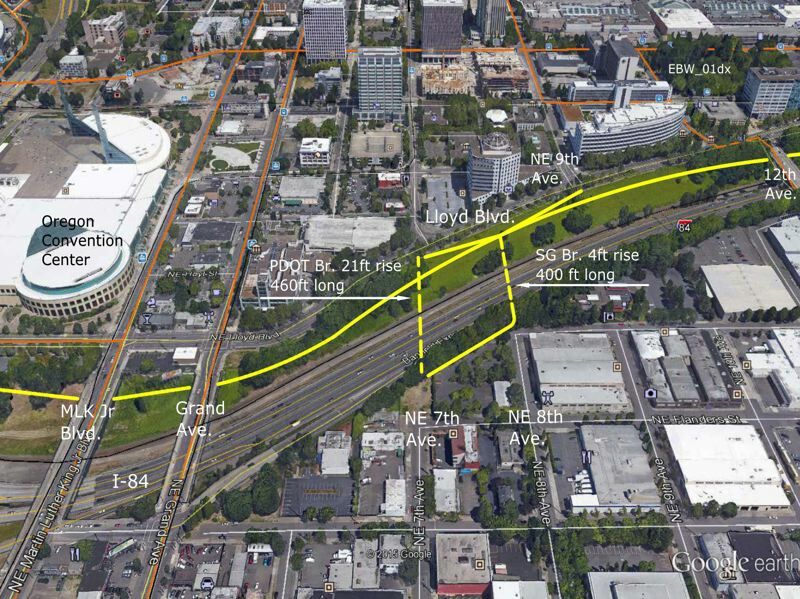 PBOT plans to span over I-84 at Northeast Seventh Avenue and land the north bridgehead on Lloyd Boulevard, which is 21 feet higher than the south bridgehead. It is also 60 feet longer than the EIghth Avenue crossing, which would cost $1.5 million more to build. Non-destination-oriented Southeast and Northeast Seventh Avenue has always been PBOT's selected corridor for the Green Loop, which lacks specific site planning details for impacted property owners and tenants to review. Logically, there needs to be a user demand model study to determine important destination priorities of bicyclists. If this survey was done, it would be obvious that most bridge users want a safe SG Trail route under the dangerous 12th Avenue to 21st Avenue and Grand Avenue/MLK Jr. Boulevard to downtown, Springwater Trail and North Williams/Vancouver Avenue corridors. It is very unusual that a new $12.5 million bridge project that will last 100 years, impacts existing street patterns and influences the creation of new transportation corridors still has no stakeholder committee to work with PBOT on planning decisions and private fundraising efforts. Instead, after 18 months of planning, PBOT had one open house in a jammed hallway for selected groups of bicyclists to review and briefly comment on decisions already made by staff. PBOT needs to demonstrate that it responds to community efforts and Portland City Council's approved Resolution 36947, which mandates city staff to fund and continue to work on developing the SG Trail. 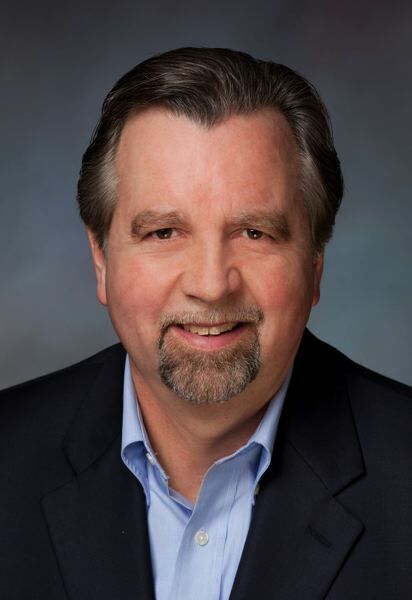 In so doing, PBOT should redirect Transportation System Plan and tax-increment financing funds for engineering and development of the first SG Trail segment between Northeast 21st Avenue and the Willamette River, which is 95 percent publicly owned. The Sullivan's Gulch Trail, which avoids busy street intersections, is a great example of true "Vision Zero" accident-prevention planning. A public servant's job is to protect the public by constructing safe bike corridors as part of this new bridge or simply use the $12.5 million to build the Sullivan's Gulch Trail instead of an expensive and dangerous bridge to nowhere safe.